DISCLAIMER! I made a very specific promise several years ago, and I intend to stick by it, so this is NOT the resurrection of the Burning Brick Awards some may have been expecting (please try to control your disappointment). This article won’t mention the name of the individual and replaces the name of the company involved with Trunk Slammer Safety, Inc., a purely fictitious, but eminently appropriate invention of the writer. The intent of this editorial is to both INFORM AHJ’s in Canada and WARN building owners, the engineering and contracting communities, that the fire alarm Verification documentation you receive might not be worth the paper it’s printed on. Our new series provides an insightful, in depth analysis on the Fire Alarm Verification process and affords jurisdictional authorities with some basic information about what you should expect to see in the way of documentation! Anytown, Canada - The building that is the subject of this particular story is located right on AnyTown’s main drag (aptly named AnyTown Street). In 2012, the outdated EPEL fire alarm control equipment was replaced by a Mircom FX-2000 system supplied and Verified by a supposedly qualified individual (Trunk Slammer Safety, Inc. maintains branch offices in every city across Canada). I had been given to understand that the bid process for the panel replacement was lengthy and quite convoluted, with a number of service providers participating. When the contract was finally awarded, the winning bid came in at considerable savings over the others that were tendered, and the work of replacing the old system began. MIX-501P - Is a “mini” module designed to fit into a single gang (or other approved for installation) back-box for connection to contact type devices like manual stations, heat detectors, low temperature sensors and the like. MIX-501MAP - Is a single zone interface module designed to mount on a 4x4 box. It’s used to connect a variety of contact type field devices as well (like heat detectors, flow switches, manual stations, etc.). MIX-502MAP - Is a single zone module designed to support conventionally wired smoke detectors. The main difference between it and the previous modules we mentioned is that it also requires a 24VDC power source connected to it (to power conventional two-wire smoke detectors). Of course, you can also connect contact type devices to it. MIX-500X - This is an Data Communication Link isolator module. It protects the DCL (Mircom’s manual identifies it as “SLC”) loop from shorts. There’s an extensive article into its required use (including the various Standards referenced) in this special report. What made this particular installation troubling is something the servicing agency which performed a recent test on the system mentioned to me, while we were engaged in discussing the topic of performance testing (to CAN/ULC-S536) addressable fire alarm systems. Not only did several smoke detectors fail to respond to test smoke, when two conventional heat detectors where physically tested, a communication fault appeared on the system and all programmed devices on the respective DCL loop suddenly went missing. On further investigation it was determined that there were NO supporting field devices installed for either of these two detectors! With so many glaring errors already identified, it was at this time that I suggested we should review the Verification Appendix “C” report that must have been filed for the installation. In accordance with the above disclaimer I won’t reveal the NAME of the service company involved, nor will I provide information regarding the physical location of the building. I am providing you the report in its entirety (with this information redacted), so you can better understand the subject of this editorial and gain some insight into how one particular agency decided to document one of the most crucial tests a fire alarm system must ever undergo in, what I’m certain, are many similarly completed projects (some perhaps even in YOUR jurisdiction). The missing sections and information will be made clear when we detail the deficiencies afterwards. It’s important for anyone reviewing a fire alarm system Verification Appendix “C” Report to understand that, while the sample format ULC suggests is an Appendix Item (the Appendix of any Standard is informative and not prescriptive), the body of the Standard makes reference to its use by employing the word “shall”, and subtle variations of this phrase: “similar to that shown in Appendix C, Fire Alarm System Verification Records” in almost every requirement in Section 3.2 Documentation of CAN/ULC-S537-04 and Section 4.2 Documentation of CAN/ULC-S537-13. 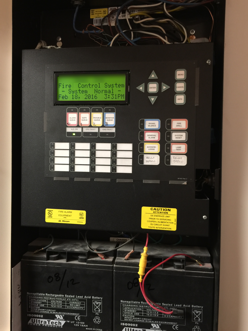 When you simply replace a conventionally wired control panel (without any upgrades or modifications to the field wiring or devices), it’s pretty well a given that you have to make the new system work the same way the original was designed, unless the local jurisdictional authority insists that the system be updated to current Building Code and CAN/ULC-S524 requirements. At the very least, when you’re upgrading to an addressable system you are required (without exception) to employ isolators within the various floor areas in order to ensure the entire system isn’t compromised by a single “short circuit” fault (you can also achieve the required level of performance by employing separate loop controllers for each area). As a matter of fact, the Installation Standard is very clear on this (reference the Clauses which are provided in the aforementioned article). Since there are NO ISOLATORS installed in the referenced system (and none mentioned on the Verification Appendix “C” report), if you impose a short across any of the data loops (which a conventional heat detector wired directly to one would do when activated), you will essentially take down the loop controller and all the devices associated with it. In a worst case scenario, if your system employs only one such controller (a single addressable loop), you’re essentially rendering the entire fire alarm system non-functional. When you add to this the failure to mention any pertinent information relating to all of the installed supporting field devices (the addressable modules that are a part of this system), and the absence of the documentation actually required by the Standard which is supposed to support a properly conducted Fire Alarm Verification, you have a Life Safety System with highly questionable performance even in the best of conditions. I shudder to think what’s going to happen during an actual fire emergency when occupant notification becomes even more critical and an absolute necessity. 2. The “installed correctly” columns on the individual device test records are marked “YES”, when in fact there are a number of field devices installed INCORRECTLY (i.e. spacing requirements for heat detectors do not comply with CAN/ULC-S524-01). 3. System is identified as a two stage system. There are no two stage manual stations installed and no documentation that might suggest this may be an approved design or that the system’s upgrade received a formal review and approval by the local jurisdictional authority. The test report does not document testing of the GA loop, required automatic transfer functions, or manual acknowledge/cancel. 4. There are a number of initiating modules (supporting field devices) installed on the data communication loop (DCL) serving the sleeping rooms and common area conventional field devices. These consist of single and dual input modules. There is no C6.1 “Device Testing - Legend and Notes” and consequently no reference to model number, type, or wiring method. In addition all field devices (supporting and active) must be individually identified, and VERIFIED (this includes testing for supervisory, ground-fault, correct annunciation and operation). 5. There are a number of relay modules (supporting field devices) installed on the data communication loop (DCL) serving the various floors of the building. There is no Appendix C6.1 “Device Testing - Legend and Notes” and consequently no reference to model number, type, or wiring method. All fire alarm field devices (supporting and active) must be individually identified, and VERIFIED (see item 4). 6. There are no sensitivity readings recorded on the individual device test record sheets for any of the smoke detectors. 7. 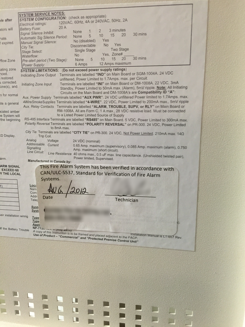 The function of a dedicated water flow relay (for offsite notification of a sprinkler trip) is not listed (or mentioned) on the test report (it was never supplied). This requirement is articulated in Sentence 3.2.4.7. (2) of BCBC 2006 (NBC 2005). 8. The DSC PC-2525 security panel utilized to transmit fire alarm signals to the fire signal receiving centre IS NOT ULC Listed for use as a fire alarm communicator as is indicated on the C1 form. 9. There is inadequate protection of Data Communication Link circuit (not a single DCL isolator was found to be installed). 10. There are two (2) conventional heat detectors installed on the Data Communications Link circuit without benefit of a connection to a supporting field device. Activation of these detectors imposes a dead short across the DCL circuit which compromised the loop controller and, in the absence of the required isolation, resulted in a total communications loss with all the terminated field devices. 11. Audibility levels have not been documented (and likely not performed). 12. There are no power supply or emergency power supply (battery) test results (likely not even performed). 14. Specific test and inspection sections that must document the wiring for the project, as well as system response times, and specific testing of the Data Communication Links are missing. We have grave reservations these were even conducted. Let’s examine another botched fire alarm Verification. The technician that performed what is supposed to document a Verification of a complete fire alarm upgrade in a three storey walk-up apartment calls this Commissioning. I call it A Complete Fraud, and yet the documentation looks to have been accepted by the local authority. Note: Underlined phrase is added here for clarification. “CFAA” and “ASTTBC” can easily be interchanged for those Canadian jurisdictions outside of British Columbia (and where a specific ASTTBC Bylaw has not yet been adopted for jurisdictions INSIDE British Columbia). So, while it’s clear that many technicians have actually been given the responsibility of reporting poor practice, the fact that examples of shoddy inspections like these continue to surface speaks to a certain reticence on the part of the same technicians that I often hear bitching about the state of the industry, as well as to the colossal failure of two key Canadian technician Certification programs. It is extremely important for any jurisdictional authority to not only understand the technical requirements involved in ensuring a fire alarm system is installed and functions in accordance with the design and CAN/ULC-S524, but to also be able to recognize a properly formatted Verification Appendix “C” report. In light of the requirements now stipulated in our National Building Code for the Commissioning (Integrated Testing) of a building’s life safety system, it behooves all parties involved to ensure that the documentation attesting to a properly conducted Verification is complete and presents an accurate reflection of this most crucial test a fire alarm system will ever undergo in its lifetime. The role of an accredited Verifier (recognized by the AHJ) has never been more important at any other time in our industry’s history. Let’s get down to the business of addressing this. Let’s not put Public Safety into the hands of companies like Trunk Slammer Safety, Inc.
SPECIAL NOTE: If you are an Authority Having Jurisdiction and would like to receive UNREDACTED copies of the complaint files mentioned below, please email a request to tech@firetechs.net. Please include your contact information in your email. Surrey, British Columbia - Formal complaints were filed with both ASTTBC and the CFAA with respect to the Verification performed, and documented by the RFPT involved in the first example provided above. The bogus Commissioning Report, in the second example, was filed by another technician who is no longer part of ASTTBC’s RFPT programme (thankfully). ASTTBC assigned an independent reviewer to investigate the alleged violations of both the Practice Guidelines and Code of Ethics suggested by the deficient CAN/ULC-S537-04 documentation that was provided (Complaint Case #16-09). The investigation report was submitted to the Practice Review Board in March of 2016 and the RFPT was found GUILTY of violating the Code of Ethics and the Practice Guideline. We received a letter stating that the PRB had imposed censure conditions on the individual responsible, but that he hadn’t yet complied with them. It is interesting to note that when the CFAA launched an investigation of this technician member’s alleged violations of THEIR Code of Ethics and Conduct, it resulted in a finding that was exactly the OPPOSITE of the ASTTBC PRB’s ruling. In the formal notice we received, The CFAA’s Executive Director, Steve Clemens, did not provide any explanation other than there were no violations and the matter was considered closed! And here’s where it gets really interesting! 3. Public safety in Canada continues to be compromised by some of the very individuals and organizations entrusted with its protection. It may appear to be an exercise in futility for anyone to even consider filing a formal complaint with ASTTBC (or the CFAA for that matter), but reporting substandard practice is an important and critical imperative if you happen to BE an RFPT. While it’s unlikely that ASTTBC will ever initiate an investigation involving a violation of Section 15 of the Practice Guideline (mentioned above), I would still advise against rolling that dice and risking your own practice. C. Y. A.! Is ASTTBC’s Case #16-09 really closed? We don’t think so. There’s a line in the sand that our Educational and Certification Initiatives are going to ensure remains clearly visible. Which side of it are YOU on?